Pilot community-based legal observation projects in Birmingham, Manchester and west London. Recruit and train local volunteers in each area as Community Monitors. Achieve increased police accountability over the treatment of individuals and the process of decision making in the three pilot areas. The need to extend into local communities the use of legal observers, whose role is to monitor the police and gather evidence of infringements of civil rights at demonstrations, was first identified during the G20 Summit in London in April 2009. In addition to policing of a highly publicised protest in the City of London, the operation by the Metropolitan Police extended to residential areas across the Docklands area, as the summit itself was held at the ExCel Centre in south Newham. Residents found that their freedom of movement was prohibited and that they were required to carry identification in case they were subject to the use of ‘stop and search’. We recognised that while what the police describe as the ‘activist community’ was able to mobilise to conduct street-level monitoring of the policing of the protest, no such mechanism existed for residents affected by the heightened police presence in their communities. This left local people without access to support or redress if they felt their rights had been infringed or curtailed. Protesters were subsequently able mount important legal challenges using the monitoring information collected by legal observers but the lack of any similar structure at a local level left the experiences of communities about the impact of the G20 policing operation largely invisible and undocumented. Netpol was set up in November 2009, bringing together for the first time organisations concerned with both the impact of policing on protests and on local communities. Through the collaboration of our partner groups from 2010-2012, we began to explore the imbalance of skills and resources between ‘activists’ and ‘communities’. We recognised that the identity of these two groups is overlapping and fluid and both are subject to similar policing strategies and tactics, but frequently there is a class and race divide between them. We began by training and supporting individual community activists and campaigners to undertake ‘interventions’, monitoring stop and searches in their communities. This was positively received, but we recognised the need to develop a more systematic approach and develop a more sustainable infrastructure. 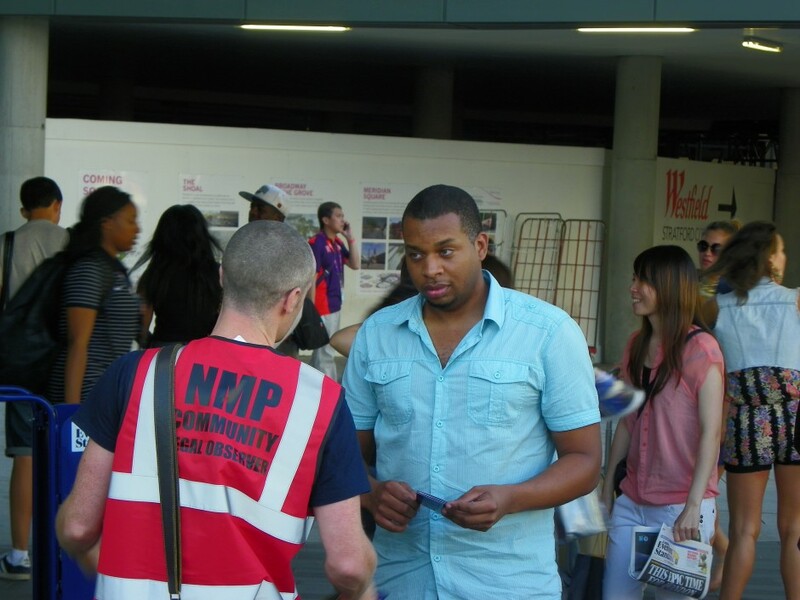 During the six weeks of the Olympics in 2012, Netpol partner group Newham Monitoring Project ran a ‘Community Legal Observer’ project with support and resources from Green & Black Cross, which normally monitors protests. The project received an overwhelmingly positive response from local people, particularly young people. A significant difference between community legal observation and protest monitoring is the extended ‘quiet times’ in a community setting with little activity to document, compared to the intensity of a protest. 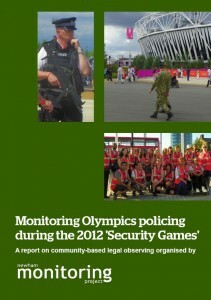 During the Olympics, volunteers used this time to talk to people about the legal observers’ role, their rights and their experiences with police and authorities in general. This had many benefits: it built trust and engagement between volunteers and the public and revealed some unexpected issues. In east London, we discovered many young men were regularly strip-searched in the back of vans and were reluctantly consenting to this as they were otherwise threatened with arrest. We were able to inform people this procedure is unlawful and also raised it with the Metropolitan Police Commissioner. It also meant we were able to extend and develop our understanding of local needs and concerns and begin to develop stronger local accountability. The project attracted volunteers from diverse backgrounds and was particularly popular amongst teachers, lawyers, activists and people from the voluntary and community sector. Feedback from volunteers indicated there was a high level of community engagement, particularly as many people were concerned about the use of stop and search and other aspects of policing, and the impact this had on young people. Many wanted to learn how to assist others but had no structure or mechanism of support to do it. A report on the lessons learned by Newham Monitoring Project is available here.